Skylar and I often wear our bunny ears. Luckily, it's Easter time. We got, "Oh, how festive!" instead of the usual "Enough already with the ears, you two!" Holidays are getting easier. I actually looked forward to the preparing. In the 'old' days my preparing was picking out a great outfit and making sure I had a hair appointment. For some reason Jimmy didn't trust me to touch anything food related. I didn't mind. I set the table and ran out for extra ice. We were a team. This year we celebrated Easter Eve which worked out perfectly since I did lots of last minute shopping and apparently most places close on Easter Sunday. Who knew? When will I stop thinking "Jimmy would...?" We were eleven people and I'm grateful I was able to surround myself with a perfect blend of family and friends. My kids, Sky and Fanny, my mother-in-law was the family. In the friends corner (I didn't actually make them sit in a corner) were Connie and Terry. Unfortunately, their daughter Kristi and her husband Matt couldn't make it, but my god-daughter Katharine and her fiance Pete were there and so were my friends Debbie and Henry. We promised to make this a yearly tradition. Still, as we anticipate many more years of happy holidays together that familiar twinge of reality is ever present. It's kind of like our innocence was collectively taken away. Year to year? We don't know from day to day. Living in the present is the only way for me to live now. Appreciating the NOW seems to work. That's why I didn't repeat last Easter's toast, "Family is doing things you don't want to do with people you don't want to do them with." "May our friends be our family and our family be our friends." 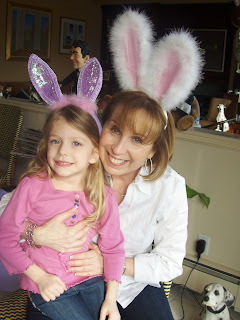 Then, Skylar and I tapped our bunny ears for luck.